After Halloween 2016, Gabe Smith and I (Chris Pyles) set out with a single goal in mind: to get F.N.Cool Entertainment up and running. This meant making art, first and foremost, but we knew we couldn’t do it all alone. Over the last year, F.N.Cool has had the privilege of working with several artists, creating and completing many projects, yet none are as fun as what you’re about to read. Over a year later, enter David Patterson… A fledging cartoonish with wit to match takes on the task of bringing over a handful of these characters to life. In this case, a group of fun-lovable demons just trying to do their jobs. Firstly, Mort is the new-hire in Hell and just happens to be seated across from Cyrus, the cynical demon who has literally been there an eternity. 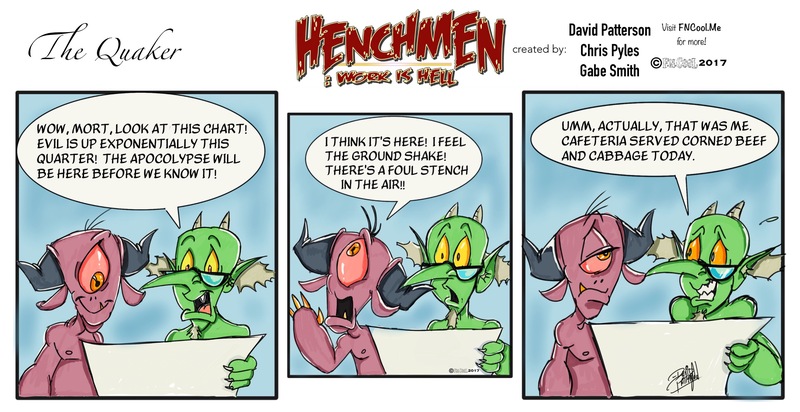 Join them as they explore the bowels of cubicle life and learn just what it takes to survive in Hell. 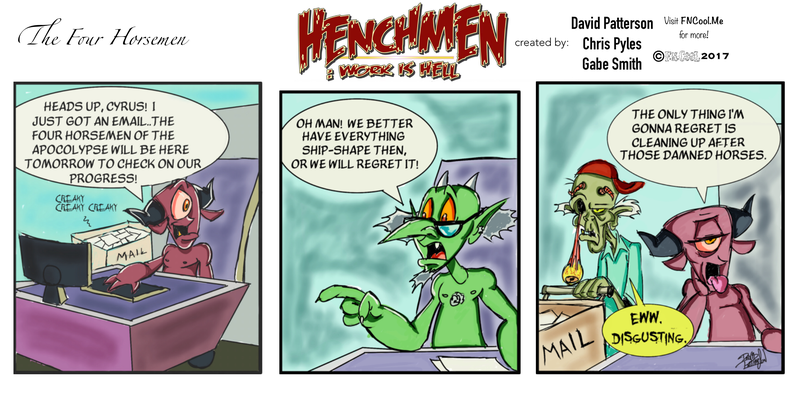 Henchmen: Work Is Hell is created by David Patterson, Chris Pyles & Gabe Smith and is a weekly comic strip in the likes of those traditional Sunday Funnies, but we figure the working man needed a little something extra to get them through the eternal back-and-forth of the weekly grind. So, with that in mind, we will be releasing a new comic strip EVERY WEDNESDAY right here on this website! Use this link and receive FREE SHIPPING on any order of $40 or more! Make sure to come back HERE everyweek to see what the gang has gotten themselves into. 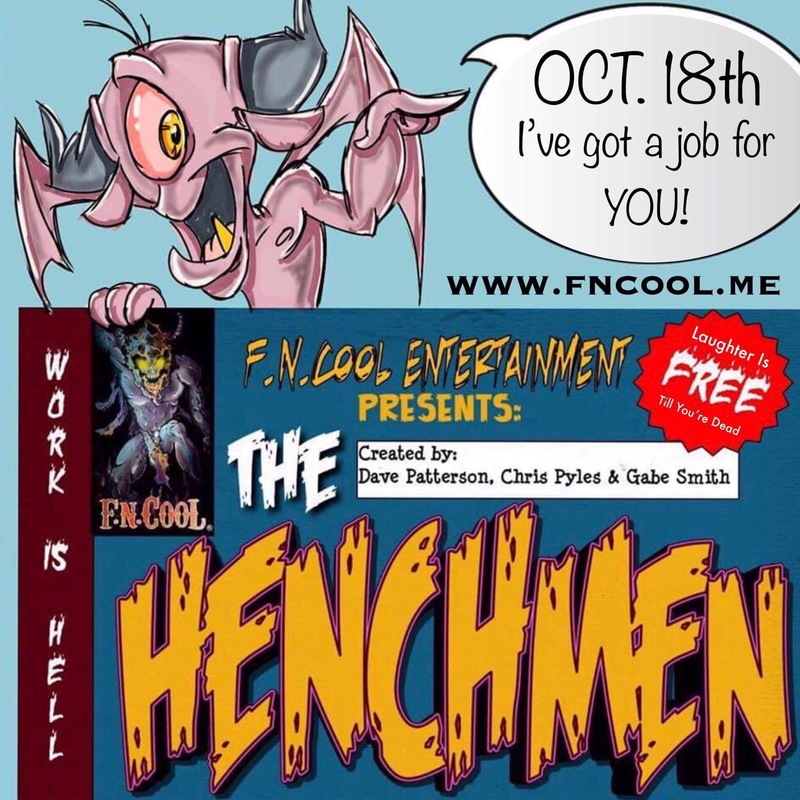 Henchmen and all associated characters are Copyright 2017 F.N.Cool Entertainment.